Loudoun Board of Supervisors Chairman Scott York (R-When It’s Convenient) is absolutely indignant that critics of his new all-Republican Board’s efforts to do the bidding of the developer and road-building industry and pave the way (as it were) for their long-cherished Outer Beltway would have the temerity to actually say out loud that it’s the Outer Beltway. “It is not a frickin’ beltway,” the eloquent chairman said. The Board as one of its first acts in January hastened to order up an amendment to the Countywide Transportation Plan widening Belmont Ridge Road/Rt 659; with dazzling speed the amendment sailed through the Planning Commission and was put on a fast track for the Supervisors’ final approval, duly voted yesterday. Although last-minute neighborhood opposition succeeded in keeping Belmont Ridge Road designated as an eventual 4-lane (though still within a 150-foot right of way . . . hmmmm), the Board approved expanding the rest of the road to 6 lanes. restoring a continuous 150-foot wide north-south Belmont Ridge Road/Northstar Blvd. corridor between Route 7 and the Prince William County line. 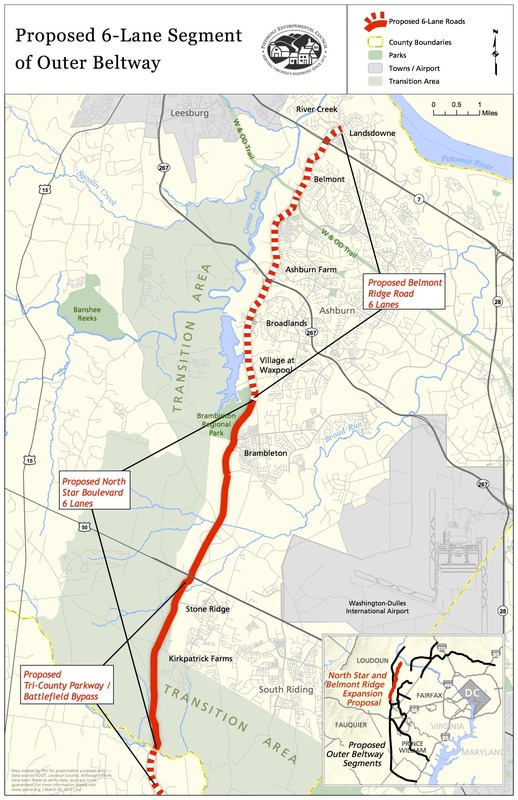 When connected with the extension of Route 234 north from I-66, the result will be a seamless multi-modal corridor from Route 7 to I-95. A “seamless” link from I-95 to Rt 7 sort of sounds like . . . an Outer Beltway, doesn’t it? But apparently York believes that merely creating a link doesn’t mean anyone will actually use it that way. Never fear.